INKin' All Night! : Happy Birthday to You! This has to be one of my favorite cards from the class! Another Annual Catalog stamp set that has been collecting dust on my shelves! Finally time to play with it and although it might seem like a little bit of a sleeper set ... wait until you see it in action! Magic! Genius!! 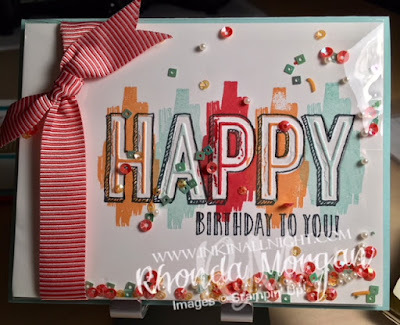 This card features the Happy Celebrations stamp set and the Celebration Duo TIEF (embossing folder) and a Clear Envelope! Colors combination includes Peekaboo Peach, Watermelon Wonder and Pool Party, with Basic Black. You start by stamping the Black greeting and then go to the TIEF embossing folder and it DEBOSSES the background of the letter/word shape and it EMBOSSES the little skinny letter shapes! Stamp over top with a background image from the set and watch the magic happen!! Stuffed in a clear envelope with some sequin embellishments and it makes for an adorable easy peasy shaker card! This was definitely a class favorite too! Labels: Birthday Card, Celebrations Duo TIEF, Happy Celebrations, INKin' All Night!, Shaker Card, Stampin' Up!